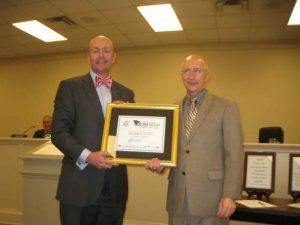 Will Williams presents outgoing Chairman Campbell a plaque indicating a work-ready county. At the January meeting of Edgefield County Council, Will Williams, President/CEO of the Economic Development Partnership, presented Council with a plaque bearing the certification of Edgefield County as a SC Work Ready Community. Williams told Council this certificate shows industries that Edgefield County has the needed work force ready and able to go to work. Williams went on to say this certification “makes my job easier on selling Edgefield County.” He also thanked Council for their leadership in this endeavor. Williams pointed out that SC has the most counties in the nation with this certification.